Summary: Consistency is a pillar of information architecture, but mixing classification schemes can be useful under the right conditions. As users, we think about things in flexible ways, and so our designs must flex too. Now, if I asked you to find this at the supermarket, where would you look? If you’re like me, you’d head straight for the baking aisle. And that’s precisely where I found myself just before Christmas, standing with a puzzled expression in front of a display of icing, sprinkles, and cake mixes … but no red food coloring. Raise your hand if you’ve ever had that experience with a website or application, looking for something that just has to be there but isn’t. In this case, my problem was that it never occurred to me to search the aisle’s content by anything but its type — spices, stocks, mixes, and so on, each in their own place. But it took a friendly store manager to illuminate that the food coloring was organized by brand. It was with all the other McCormick products, across from the garlic powder and under the rows of peppercorns. After all, what matters is whether a schema reflects the user’s mental model, not whether it adheres to some perceived ideal of how things ought to be organized. Sticking with the supermarket example, many stores have ethnic food sections (Asian, Mexican, Caribbean, and so on) that don’t fit perfectly into what appears to be the overriding schema. Yet those sections are useful because there are certain products that customers expect to find grouped by country of origin. I can only assume that when supermarkets decide to create a special section, they’ve done their homework. The same should apply to anybody designing websites and apps. I even could’ve found it in Amazon’s section dedicated to McCormick products, if that’s how I thought to search for it. So even when a classification appears to be mixed, it can have an underlying, unifying organization that makes it work consistently. they violate hierarchies that are otherwise clear, well-defined, well-labeled, and consistent. i. Brand: e.g. McCormick, Giant Eagle, etc. 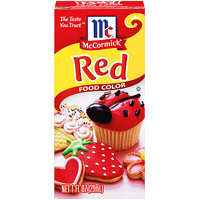 In short, McCormick’s food coloring was classified at the wrong level in an otherwise clear schema, making it difficult to find. That’s poor design, or a mistake at the very least. As another wise UX Stack Exchange user points out, there’s nearly never a “perfect” classification scheme. As users, we think about things in flexible ways, and so our designs must flex too. And none of this is to even get into non-hierarchical faceted schemas. Under the right conditions, mixed classifications can be even more effective than uniform ones. I’ll certainly have my eyes open now for this architecture pattern, both online and off.